Today’s Morning Buzz is by Kylie Bayer, HR Manager (LinkedIn, Twitter) with the City of McMinnville. What I’m Reading: A cookbook called Salad Days, it makes me want to eat more veggies. In the final interview for my current role (HR Manager), my boss asked me what I don’t know how to do. My stomach dropped because I knew they were having a rough contract negotiation in the Fire Department and that was the one big thing I didn’t know how to do. I’d never negotiated a labor contract. It all worked out (I’ve been in my new role about five months now) and while I’m getting to do a ton of really neat things like redesign the employee handbook, lead a classification and compensation study, and streamline our recruitment process I also get to navigate the interest arbitration process between our local chapter of the International Association of Fire Fighters and City management. And let me tell you, it’s pretty crappy! For everyone involved! I don’t know anyone involved in this that has had a good time! We are currently awaiting an interest arbitration ruling on our collective bargaining agreement. We went through the hearing process last week and should know the arbitrator’s decision in 2-3 months. I think I can speak for all (or nearly all) HR Managers, Fire Chiefs, Union Members, City Attorneys, Finance Directors, and City Managers when I say that no one wants to end up in arbitration of any sort. Arbitration means we couldn’t get to an agreement ourselves and now a neutral party gets to decide how the organization should proceed. In Oregon that neutral party, an administrative judge, selects one of the two last best offers proposed. We will end up with either the last best offer the City proposed or the last best offer from the Union; no fancy merging of the best parts of both offers, just one or the other. And whichever offer is selected, it feels like nobody wins. Now that we’re in the waiting game we’re all wondering how do we show up for work right now? Do we just pretend the arbitration isn’t happening? Do we silently stew about things that were said in the arbitration hearing? What the hell do we do to make it less awkward? Start or reinvigorate a formal labor/management committee (LMC). An LMC can be a strategy to navigate labor/management relations in a more collaborative manner. Roll out initiatives jointly. Next time your City kicks off a fire prevention initiative, do it with both the City and the Union spearheading the initiative. Consider jointly developing rules or norms to abide by during labor/management meetings. Practice conducting respectful meetings. Stick to an agenda, come to the meeting prepared, complete any action items before the next meeting. Follow any rules/norms set out in the above bullet. Don’t just focus on labor/management relationships when the contract is up or you have a wage reopener. Like any relationship, you’ve got to work on it all the time. Support each other’s events and celebrations. If you’re on the management side, be sure to extend an invitation to the union employees for retirement parties and social events. On the labor side, you should extend an invitation to the Chief and Assistant Chief(s) to an upcoming shift meal or another community event. Consider attending the Labor-Management Alliance Conference in 2020. This conference looks like a great opportunity for Fire Chiefs and Union Leaders to learn additional strategies about how to work collaboratively. Depending on the educational session topics it may be beneficial for people who do not work in the fire service. 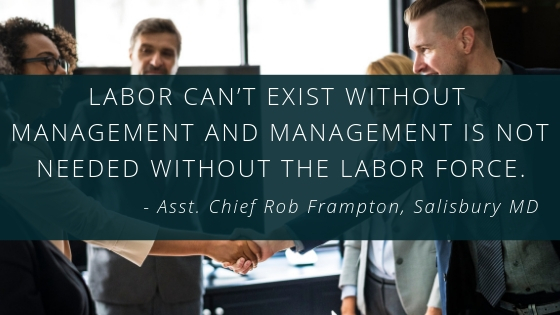 Check out this article by Assistant Chief Rob Frampton of the Salisbury MD Fire Department titled Labor-Management Relations: Building Our Teams for other ideas and inspiration. At my City, we’re exploring an LMC and are looking for some initiatives our union leadership can roll out jointly with our labor union. It’s a little awkward coming back to work after an arbitration hearing but I’m confident we’ll get through it. After all, we’ve got residents to serve and a City to keep safe.